With the ringing in of the new year comes a slew of resolutions and goals. The most common of these is "I'm going to lose weight!" And like many others, I've vowed to shed those extra pounds so I look less like a gluttonous beast. Greek god would be nice, but that would be setting myself up for failure. I digress. To aid in the goal of losing a set amount of weight, I needed a way of tracking my progress. Enter Weight Tracker. 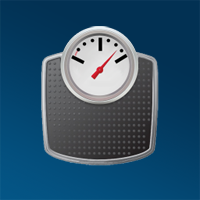 Weight Tracker is a free, simple app designed to track weight and the desired goal weight and completion date. Opening the app brings up a list of weights and dates and is where one enters their current weight. Moving to the right displays a graph which gives a visual representation of weight lost and gained in relation to the goal weight. It presents this over a timeline, so it's easy to see the progress you need to make. Moving right again shows the progress pane where the data is represented in a form of clock. Below that is the weight lost, weight to lose, days elapsed, and days remaining. The app is simple and there aren't many features, but there doesn't need to be. I'm not tracking body fat percentages; just my weight and deadline. It's a great way to check several times a day and remind myself of the goals I've set. That and it doesn't judge me like the Wii Fit Balance Board.